By Louis Jacobson on Thursday, October 26th, 2017 at 9:00 a.m.
How solid is the White House's assertion that the typical family would get a $4,000 raise from its tax proposal? We took a closer look. In its bid to sell a tax overhaul proposal, the White House has boiled down a series of complicated policy changes into an alluring talking point: The plan means a $4,000 raise for the typical family. "The average American family would get a $4,000 raise under the President’s tax cut plan. So how could any member of Congress be against it?" tweeted White House Press Secretary Sarah Huckabee Sanders on Oct. 22. The average American family would get a $4,000 raise under the President’s tax cut plan. So how could any member of Congress be against it? She reiterated the figure in a tweet later the same day: "What would your family do w/ a $4,000 raise from the President’s tax cut plan? REPLY & I’ll share your family’s story in the press briefing." Some economists have criticized the $4,000 "raise" as overly optimistic and based on an incomplete plan. Others backed it up. We decided to take a look for ourselves. We found that even if you buy the White House’s math -- which many economists do not -- this selling point leaves out a lot of information for a general audience. There are lots of reasons that this $4,000 windfall might not materialize. The White House’s Council of Economic Advisers looked at other developed countries that have lowered their corporate tax rate in order to see what impact that change had for wage growth in a recent paper. The council argued that cutting corporate taxes will not only benefit corporate shareholders but will encourage firms to invest in ways that eventually lead to higher wages. Specifically, the paper concluded that average household income from wages and salaries would increase by between $4,000 to $9,000 as a result of a corporate tax cut, and by between $3,000 and $7,000 for the median household. The White House pointed us to several prominent economists who have made similar arguments, including Larry Lindsey, who headed the National Economic Council under President George W. Bush; Edward Lazear, who headed the Council of Economic Advisers under Bush; and Laurence Kotlikoff, who served on the Council of Economic Advisers under President Ronald Reagan. Kotlikoff told PolitiFact that a study he co-authored found a gain of $3,500, "but $4,000 is in the ballpark of what's feasible." And one of his co-authors on that paper, Seth G. Benzell, called the White House’s estimate "a reasonable one, well supported by the economic literature." We heard skepticism, however, from several economists whose work is cited in the council’s paper. Mihir Desai, a Harvard Business School professor, pointed us to remarks he made to the New York Times critical of the White House’s use of his research. "I’m a believer in corporate tax reform, and I’m a believer in corporate tax cuts, and I believe they would go to workers," he told the Times. "But I don’t believe those numbers add up." Dhammika Dharmapala, a tax specialist at the University of Chicago Law School, told PolitiFact that the $4,000 figure "is well outside that suggested by the scholarly consensus." And Kimberly Clausing -- a Reed College economist whose work was also cited -- also called the finding inaccurate: "It is wrong in a way that lacks any nuance." One key point of contention has to do with who gets what share of the benefits that flow from a corporate tax cut. "There is nothing in the tax cut that says firms will increase pay," said Richard B. Freeman, a Harvard economist. "They could spend it all on new investment, on buying back their shares, on dividends, or on pay for CEOs." Others have used back-of-the-envelope calculations to raise questions about the assertion. Our friends at FactCheck.org noted that there are about 126 million households in the United States, meaning that a $4,000 increase in income per household would produce an income gain of more than $500 billion a year — yet that’s well above the $297 billion in corporate income taxes collected in fiscal year 2017. Marc Goldwein, the senior policy director for the fiscally hawkish Committee for a Responsible Federal Budget, said the challenge is equally stiff if you look at the numbers in reverse. The White House tax proposal is poised to cost $1.5 trillion in lower revenue over a decade, or $150 billion per year. If you divide that by 126 million households, it works out to $1,200 less in tax burdens per household per year. Yet the administration is promising $4,000 less per household, leaving a gap of $2,800 in lower taxes that has to be made up through economic growth. "I’m not saying it’s impossible that well-designed tax reform could provide $4,000 per household, but it seems unlikely to me," he said. 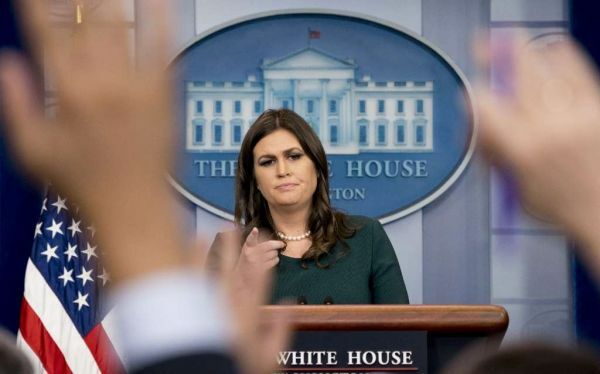 But even if you are open to the White House’s case, we found a number of concerns about Huckabee Sanders’ statement, including several that were acknowledged by economists who are otherwise favorable to the White House’s approach. The Council of Economic Advisers report cautions that "these are the long-run, recurring values measured in 2016 dollars; households would receive these benefits each year once the changes in the corporate tax have been fully absorbed by the economy." In other words, you likely won’t be getting that extra money until several years from now. But even if you use the median figure, it doesn’t necessarily tell you how much the gains will be skewed toward the upper end. Benzell, who is otherwise favorable toward the White House analysis, cautioned that "it is certainly possible that this reform will increase top-percentile inequality — that isn’t a focus of our study," he said. "This is another area of disagreement about the bill — not whether it will increase incomes, but how those gains will be balanced between rich and poor." The lack of a finalized tax bill makes it hard to decisively predict the impact for a typical taxpayer. What’s been released so far "has lots of missing pieces at this point, many of which will impact the end result," said Kent Smetters, a Wharton School of Business professor and former Treasury Department official during the George W. Bush administration. Aparna Mathur, a resident scholar at the conservative American Enterprise Institute whose work was cited in the Council of Economic Advisers’ paper, cautioned that if the extra $4,000 is to materialize, it will be dependent on successful implementation and an absence of unexpected hurdles. "In particular, a tax package that adds greatly to the deficit would likely lead to much lower wage hikes than we would like," she said. The White House said it would continue to analyze the impact of the bill as new elements come into focus. That said, the White House has chosen to offer Americans a rosy scenario that could take years to come to fruition, if it ever does at all. Moral of the story: Don’t count your $4,000 nest-egg until it hatches. "The average American family would get a $4,000 raise under the President’s tax cut plan."